1. 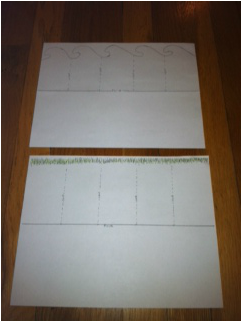 Trace and cut waves on the top of the Aquatic Foldable. Cut fringe to replicate grass on the Terrestrial Foldable. These foldables are simply hot dog foldables with five panels cut on one of the sides. Here's what the Aquatic Foldable looks like. 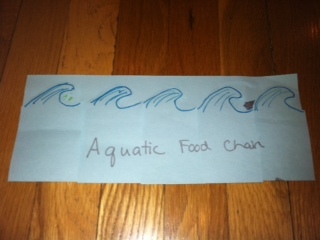 Here's what the Aquatic Foldable looks like from the outside. 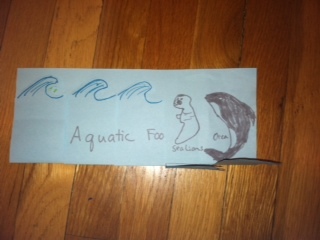 The Orca is peaking through as the last on this food chain. The detail is under the flaps. 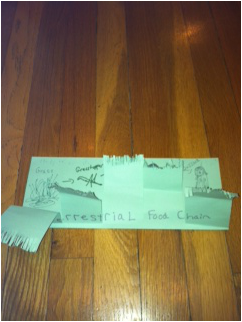 Here's what the Terrestrial Food Chain Foldable looks like. The Grass is depicted to the far left, then a grasshopper, with the Vulture peaking out as the top of this Terrestrial Food Chain to the far right.